This chapter mirrors the analysis in Chapter 5, but applies it to couples who were separated when the interviews were conducted. Rather than prioritising the voices of the offenders (as was done in Chapter 5), this chapter begins with the stories of the victims. Their lives pre- and post-separation are described, including information about the length of the relationships, shared parenting and the impacts of substance abuse. The women’s views about attending (or not attending) court and how a mainstream court process compares to an Indigenous sentencing court process, for both them and the offender, are reported. 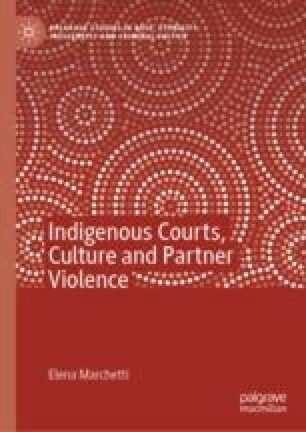 This chapter explores the combined influences of separating from a partner and having been sentenced in the presence of Elders and Community Representatives, who offer a community-based policing and support function. This sheds light on what assistance and programs are needed for Indigenous partner violence offenders to change their behaviour. Fitzgerald, J. (2008) Does Circle Sentencing Reduce Aboriginal Offending? Sydney: NSW Bureau of Crime Statistics and Research 115. Available at: http://www.bocsar.nsw.gov.au/Documents/CJB/cjb115.pdf (Accessed: 18 May 2015). Steering Committee for the Review of Government Service Provision (2013) Report on Government Services 2013. Canberra: Productivity Commission. Available at: http://www.pc.gov.au/gsp/rogs/2013 (Accessed: 26 February 2014).